Take action: Free Palestinian human rights defender Ayman Nasser + hunger strikers Sharawna, al-Issawi and al-Barq! One year after the historic prisoner exchange in which 1,000 Palestinian prisoners were released from Israeli prisons, concluding a 14-day mass hunger strike in the occupation prisons, Palestinian prisoners continue under siege. Human rights defender Ayman Nasser of Addameer Prisoner Support and Human Rights Association was seized by Israeli occupation forces on October 15, while hunger strikers Ayman Sharawna and Samer al-Issawi – both re-arrested after their release in the prisoner exchange – continue their heroic fasts for freedom. Samer al-Barq, who recently concluded a 123-day strike, has resumed his strike after Israel dishonoured their agreement. Click here to act now to demand the release of Nasser and freedom for Sharawna, Issawi and al-Barq! Palestinian former prisoners – a number of whom were displaced to Gaza from their homes elsewhere in Palestine at their release – both celebrated their freedom on the anniversary while demanding that those inside Israeli prisons be freed to join their brothers and sisters outside. Meanwhile, Nasser, a key prisoners’ rights advocate, was himself seized and detained behind bars in an Israeli occupation prison. Like many Palestinian prisoners, Ayman is subject to medical neglect – he is currently only receiving two out of the five medications that he requires daily. Addameer reported, “The judge ruled that based on ‘secret evidence’ he would extend Ayman’s interrogation period for another seven days and referred the situation of the medicine to the doctor at Moskobiyyeh detention center.” Moskobiyyeh, where Ayman is now held, is one of the most notorious detention centres in the Israeli occupation system; he was interrogated for 10 hours straight on October 17 and his interrogation has continued with similar intensity since that time. Click here to send a letter to Israeli officials demanding the immediate release of Ayman Nasser and an end to the persecution of Palestinian human rights defenders. 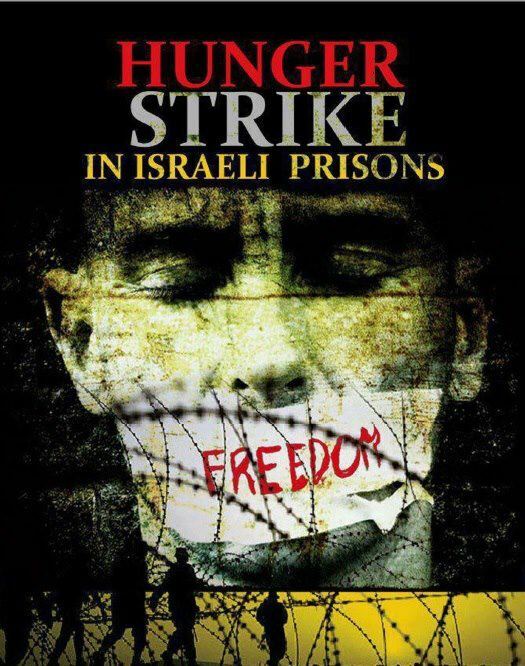 While Nasser‘s detention was being extended, and on the anniversary of his own release in the historic prisoners exchange of 2012, hunger striker Ayman Sharawna, who is now on his 114th day of hunger strike, was transferred to solitary confinement in Ramle prison. Tadamun foundation reported that Sharawna was transferred after refusing medical services in Ramle hospital. He has lost 80% of his vision in his right eye (while already having lost vision in his left eye) and is now almost completely blind. He suffers from severe kidney problems as well as back pain, for which he is denied treatment so long as his hunger strike continues. Sharawna has been detained without charge or trial since he was re-arrested January 31 after a few short months of release. Samer Issawi has been on hunger strike since August 1 and is now on his 83rd day of hunger strike. Issawi was also freed in last year’s prisoner exchange, and re-arrested on July 7, 2012, accused of leaving Jerusalem, to where he is restricted under the terms of his release. As reported in the Electronic Intifada, the prisoners initially refused this condition but signed to it under assurances from Egyptian officials that it was a mere formality. The International Committee of the Red Cross and prisoner support and human rights groups have been denied access to visit him; he is committed to continue his strike until freedom and has refused deportation. Samer al-Barq, who previously ended his 123-day hunger strike on September 21 following a commitment by the Israelis to deport him to Egypt, where he sought to reunite with his Pakistani wife, resumed his own hunger strike on October 14 after the agreement was not honoured by Israel. Al-Barq has resumed his strike and is demanding his freedom. He has been held without charge or trial since 2010. Click here to take action to demand freedom for the hunger striking heroes! 1. Click here to send a letter to Israeli officials demanding the immediate release of Ayman Nasser and an end to the persecution of Palestinian human rights defenders. 2. Click here to send a letter to Israeli officials demanding the immediate release of hunger strikers Ayman Sharawna, Samer al-Issawi, and Samer al-Barq! 3. Tweet #FreeAyman to draw attention to his case. Click here to see sample Tweets developed by OccupiedPalestine. 4. Join a protest or demonstration outside an Israeli consulate for Palestinian prisoners. Many groups and organizations are holding events – join one or announce your own. Organizing an event, action or forum on Palestinian prisoners on your city or campus? Use this form to contact us and we will post the event widely. If you need suggestions, materials or speakers for your event, please contact us atsamidoun@samidoun.ca. 5. Contact your government officials and demand an end to international silence and complicity with the repression of Palestinian political prisoners. In Canada, Call the office of John Baird, Foreign Minister, and demand an end to Canadian support for Israel and justice for Palestinian prisoners, at : 613-990-7720; Email: bairdj@parl.gc.ca. In the US, call the office of Elizabeth Jones, Acting Assistant Secretary of State for Near East Affairs (1.202.647.7209). Demand that Elizabeth Jones bring this issue urgently to her counterparts in Israel. 6. Join in the call for Boycott, Divestment and Sanctions. Boycott Israeli products, and academic and cultural institutions until all Palestinian rights (including the right of refugees to return, to be free from occupation and for full equality) are fulfilled – including freeing the thousands of Palestinian prisoners behind bars.